was established in 1999 with the assistance of ‘The Prince’s Trust and BDEF’ by Liam Agnew (BA Hons) who was born in Bristol and studied Graphic Design at Bournemourth and Poole College of Art and Design.Now based on Gloucester Road since 2011 we are going from strength to strength creating commercial and creative solutions for local, national and international customers. Call us now to discuss your requirements. We look forward to hearing from you and working with you soon!. 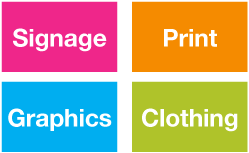 Check out our websites for Signage, Print, Graphics and Clothing.